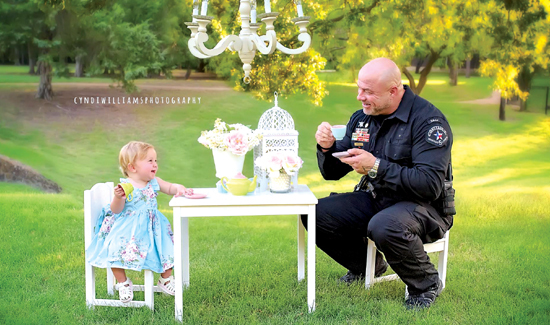 Texas police officer Deputy Constable Mark Diebold was on his way to work last year when he noticed a car that had passed him driving well over the speed limit. At the next light, Caleb Hall rolled down the window at the next traffic light to alert the Tarrant County police officer that his wife’s water just broke. A few minutes later in the parking lot of a gas station, Diebold helped Caleb and his wife Destiny deliver a baby girl. Since the birth of the Hall’s daughter Evelyn, Diebold’s been kind of like a favorite uncle. He even got invited to Evelyn’s first birthday tea party. “It was amazing,” Diebold told ABC News about taking the photos. “I come from a long line of law enforcement. My grandfather, Lawrence Dasch, was a police officer in St. Charles Parish. My mother, BJ Elmore, is a retired police officer in St. Charles Parish. My sister, Michelle Verrett, is a police officer in Lafourche Parish, all in Louisiana.